Photographic books allow sensational sports images to be presented in the best possible way – nice and big and beautifully printed on high quality art paper. This gives such books a 'wow' factor accentuated by the fact that in the digital age most people are used to viewing such images on their phones or computer screens. This makes these books incredibly effective as marketing tools, corporate gifts or for sponsor activation projects. "When you put your life's work into a book you want to know that the publisher you are working with is going to share your passion and love for great photography, while also having the expertise to produce the best possible product. 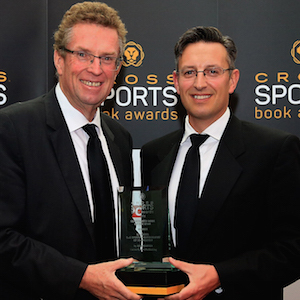 Vision Sports Publishing delivered on both those counts and the result is an award-winning book that I am very, very proud of." This beautiful coffee table book serves as a gallery for the wonderful photography supplied by Bob Martin and his team at each year's Championships. Written by All England Club committee member Ian Hewitt, the book cleverly captures a generic day in the life at Wimbledon. The biggest book we have ever published, at 400 x 267mm, this sensational publication celebrates the work of multi-award-winning sports photography legend Bob Martin. Showcasing some of Bob's most incredible pictures from his stellar career behind the lens, the book was widely acclaimed and won several prestigious publishing awards. This neatly packaged Wimbledon photographic book was designed to be a more compact and manageable – yet still high-quality – product for visitors to The Championships. The square book was contained in a slipcase featuring a die-cut circle which revealed the Wimbledon logo printed on the book cover inside.